Credit Suisse's founder, Alfred Escher, was called, "the spiritual father of the railway law of 1852," for his work defeating the idea of a state-run railway system in Switzerland in favor of privatization. Escher founded Credit Suisse (originally called the Swiss Credit Institution, i.e., Schweizerische Kreditanstalt) in 1856 primarily to provide domestic funding to railway projects, avoiding French banks that wanted to exert influence over the railway system. Escher aimed to start the company with three million shares and instead sold 218 million shares in three days. The bank was modeled after Crédit Mobilier, a bank funding railway projects in France that was founded two years prior, except Credit Suisse had a more conservative lending policy focused on short-to-medium term loans. In its first year of operation, 25 percent of the bank's revenues was from the Swiss Northeastern Railway, which was being built by Escher's company, Nordostbahn. 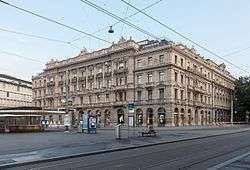 A series of international investigations took place in the early 2000s regarding the use of Credit Suisse accounts for tax evasion. The Brazilian government investigated 13 former and current Credit Suisse employees in 2008. The investigation led to arrests that year and in 2009 as part of a larger crackdown in Brazil. Four Credit Suissse bankers were accused of fraud by the US Justice Department in 2011 for helping wealthy Americans avoid taxes. German authorities found that citizens were using insurance policies of a Bermuda-based Credit Suisse subsidiary to earn tax-free interest. In November 2012, Credit Suisse's asset management division was merged with the private banking arm. 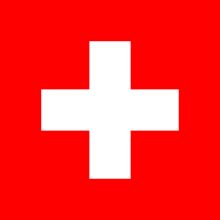 In September 2012, the Swiss government gave banks like Credit Suisse permission to provide information to the US Justice Department for tax evasion probes. In February 2014 it agreed to pay a fine of $197 million after one of its businesses served 8,500 US clients without registering its activities, leading to suspicion as to whether it was helping Americans evade taxes. It was one of 14 Swiss banks under investigation. Separately, in 2013, German authorities began to probe Credit Suisse, its private bank subsidiary Clariden Leu, and its regional subsidiary Neue Aargauer Bank for helping German citizens evade taxes. The bank eventually entered into a €150 million settlement with the government. ↑ Franklin, Joshua; Bart, Katharina (June 1, 2015). "Thiam gets to work at Credit Suisse as new team takes shape". Reuters. Retrieved July 3, 2015. 1 2 3 4 5 6 "Annual Report 2015" (PDF). Credit Suisse. Retrieved 10 March 2016. ↑ "2 Reasons Credit Suisse and UBS Look Like Safe Bets" (web). Motley Fool. Retrieved 2 May 2016. ↑ "Credit Suisse Pleads Guilty to Conspiracy to Aid and Assist U.S. Taxpayers in Filing False Returns". Department of Justice. May 19, 2014. Retrieved June 19, 2016. ↑ "Credit Suisse fined $2.6bn in US tax evasion case". Switzerland News.Net. Retrieved 20 May 2014. ↑ "The Scorpio Partnership Global Private Banking Benchmark 2014". Scorpio Partnership. Retrieved 27 November 2014. 1 2 "Articles of Association of Credit Suisse Group AG" (PDF). Credit Suisse. Retrieved 20 November 2012. ↑ "Corporate Governance Guidelines of Credit Suisse AG" (PDF). Credit Suisse. Retrieved 20 November 2012. ↑ "Organizational Guidelines and Regulations of Credit Suisse Group AG and of Credit Suisse AG" (PDF). Credit Suisse. Retrieved 20 November 2012. ↑ B. H. Meyer; Hans Dietler (1899). "The Regulation and Nationalization of the Swiss Railways". Annals of the American Academy of Political and Social Science. Sage. 13: 1–30. doi:10.1177/000271629901300201. ISSN 0002-7162. JSTOR 1009453. 1 2 3 4 5 6 7 8 Henri B. Meier; John E. Marthinsen; Pascal A. Gantenbein (1 October 2012). Swiss Finance: Capital Markets, Banking, and the Swiss Value Chain. John Wiley & Sons. p. 89. ISBN 978-1-118-22508-0. 1 2 3 4 5 6 7 Pohl, Manfred (1994). Handbook on the History of European Banks. Edward Elgar Publishing. p. 1016. ISBN 978-1-85278-919-0. 1 2 3 4 5 Sandy Franks; Sara Nunnally (2010). Barbarians of Wealth: Protecting Yourself from Today's Financial Attilas. John Wiley & Sons. p. 198. ISBN 978-0-470-94658-9. 1 2 3 4 Jung, Joseph (2000). From Schweizerische Kreditanstalt to Credit Suisse Group: The History of a Bank. NZZ Verlag. ISBN 3-85823-891-0. ↑ Hausman, William J.; Hertner, Peter; Wilkins, Mira (2008). Global Electrification: Multinational Enterprise and International Finance in the History of Light and Power, 1878–2007. Cambridge University Press. p. 98. ISBN 978-0-521-88035-0. ↑ Hill, Kelly (1999). Cases in Corporate Acquisitions, Buyouts, Mergers, and Takeovers. Gale. ISBN 0-7876-3894-3. 1 2 Meier, P. J. (June 1960). "Reviewed Work: Schweizerische Kreditanstalt 1856–1956 by Walter Adolph Jöhr". The Journal of Economic History. Cambridge University Press. 20 (2): 328. JSTOR 2114865. ↑ Jung, Joseph (2002). Credit Suisse Group Banks in the Second World War: A Critical Review (2nd ed.). Neue Zürcher Zeitung. ISBN 3-85823-994-1. ↑ Honan, William H. (16 April 1999). "Estelle Sapir, 73, Who Fought Bank Over Holocaust Assets". The New York Times. Retrieved 12 October 2012. ↑ Atkinson, Mark (4 August 2000). "Swiss banks agree $1.25bn Holocaust deal". The Guardian. Retrieved 12 October 2012. ↑ Vischer, Frank (2001). "Der Handel mit ausländischen Wertpapieren während des Krieges und die Probleme der deutschen Guthaben in der Schweiz sowie der nachrichtlosen Vermögen aus rechtlicher Sicht". Die Schweiz, der Nationalsozialismus und das Recht, Bd. 2. Chronos. ISBN 978-3-0340-0619-4. 1 2 Andrews, Edmund L. (23 October 1998). "International Business: When the Sure-Footed Stumble; Swiss Banks Stagger After Several Investing Missteps". The New York Times. Retrieved 27 August 2012. ↑ "Banking: Suicide in Switzerland". Time. Vol. 109 no. 21. 23 May 1977. p. 82. ↑ Gambee, Robert (1999). Wall Street: Financial Capital. W. W. Norton & Company. p. 123. ISBN 978-0-393-04767-7. ↑ Crabbe, Matthew (January 1989). "Gut's Secret Money". Euromoney. Retrieved 27 August 2012. 1 2 Greenhouse, Steven (10 April 1989). "Swiss Bank Turns Aggressive". The New York Times. pp. D1–D2. Retrieved 27 August 2012. ↑ Grant, Linda (19 August 1996). "Will CS First Boston Ever Win?". Fortune. pp. 30–34. Retrieved 27 August 2012. ↑ Cooper, Ron (14 October 1991). "Gut Instincts". Forbes. Vol. 148 no. 8. pp. 169–170. ↑ Thomasson, Emma (15 November 2011). "Update 5-C: Suisse ends oldest Swiss bank brand Leu". Reuters. Retrieved 21 November 2012. ↑ "Offer Made to Create Largest Swiss Bank Group". The New York Times. 6 January 1993. Retrieved 21 November 2012. ↑ Olson, Elizabeth (21 June 2002). "Credit Suisse's Insurance Unit To Get Infusion of $1.1 Billion". The New York Times. Retrieved 30 November 2012. ↑ Gasparino, Charles (16 February 1999). "Credit Suisse Agrees to Purchase Unit of Warburg Pincus for $650 Million". The Wall Street Journal. p. B14. ↑ Fairlamb, David; Rossant, John; Thornton, Emily (11 September 2000). "This Bank Keeps Growing And Growing And ...". Business Week. p. 134. Retrieved 3 October 2012. 1 2 3 Tagliabue, John (29 November 1996). "Taking the Challenge of Streamlining Credit Suisse". The New York Times. pp. D9, D14. Retrieved 27 August 2012. ↑ "Credit Suisse Restructures". The Banker. August 1996. p. 5. ↑ Strom, Stephanie (30 July 1999). "Japan Revokes Credit Suisse Unit's Banking License". The New York Times. Retrieved 27 August 2012. 1 2 3 Avery, Helen (2010). "Credit Suisse reaches the summit of private banking". Euromoney. 41 (490). pp. 56–60. ↑ Gatti, Claudio; Eligon, John (15 December 2009). "Iranian Dealings Lead to a Fine for Credit Suisse". The New York Times. Retrieved 20 November 2012. 1 2 Lucchetti, Aaron; Solomon, Jay (17 December 2009). "Credit Suisse's Secret Deals". The Wall Street Journal. Retrieved 13 October 2012. ↑ Ratcliffe, Alice (27 April 2006). "Credit Suisse to Merge Private Banks to Raise Profit". Bloomberg. Retrieved 19 November 2012. ↑ "Bankruptcy case heats up for former Oregon timber tycoon Tim Blixseth". The Oregonian. Associated Press. 24 February 2010. Retrieved 30 November 2012. ↑ Church, Steven; Effinger, Anthony (6 April 2011). "Tim Blixseth facing forced bankruptcy over taxes". Bloomberg. Retrieved 30 November 2012. ↑ Stempel, Jonathan (4 January 2010). "Credit Suisse sued over resorts, $24 billion sought". Reuters. ↑ Mijuk, Goran (18 January 2008). "Credit Suisse Plans to Expand Private Banking World-Wide". The Wall Street Journal. Retrieved 21 October 2012. ↑ Simonian, Haig (11 February 2009). "Credit Suisse losses widen to SFr8bn". Financial Times. Retrieved 9 October 2012. ↑ Reuters (20 November 2012). "New York Sues Credit Suisse Over Mortgages". The New York Times. Retrieved 29 November 2012. ↑ Freifeld, Karen; Frankel, Alison (4 October 2012). "Exclusive: Credit Suisse probed over mortgages – sources". Reuters. Retrieved 4 October 2012. ↑ Greil, Anita; Lucchetti, Aaron (26 September 2012). "Credit Suisse May Revamp Asset-Management Unit". The Wall Street Journal. Retrieved 29 November 2012. ↑ Kandell, Jonathan (March 2012). "Swiss Banks Adjusting To Radical New Regulations". Institutional Investor. Vol. 46 no. 2. p. 33. ↑ Murphy, Megan (28 July 2011). "Credit Suisse to axe 2,000 jobs". Financial Times. Retrieved 20 November 2012. ↑ Logutenkova, Elena (20 November 2012). "Credit Suisse to Revamp Investment Banking, Private Bank". BusinessWeek. Retrieved 29 November 2012. ↑ Barreto, Elzio (23 April 2008). "Credit Suisse banker arrested in Brazil tax probe". Reuters. Retrieved 19 January 2013. ↑ Associate Press (11 February 2009). "Brazil Arrests 19 In Tax Evasion Scheme". CBS News. Retrieved 19 January 2013. ↑ Browning, Lynnley; Werdigier, Julia (23 February 2011). "U.S. Accuses Four Bankers Connected to Credit Suisse of Helping Americans Evade Taxes". The New York Times. Retrieved 19 November 2012. ↑ Voreacos, David (15 August 2011). "Credit Suisse May Settle U.S. Probe by Admitting Wrongdoing, Paying Fine". Bloomberg. Retrieved 20 November 2012. ↑ Crawford, David; Saunders, Laura (11 July 2012). "Clients of Swiss Bank Raided in Tax Probe". The Wall Street Journal. ↑ Bart, Katharina (20 November 2012). "Credit Suisse shuffles top executives, merges units". Reuters. Retrieved 23 November 2012. ↑ Greil, Anita (17 September 2012). "Credit Suisse to Give More Files". The Wall Street Journal. Retrieved 7 September 2013. ↑ Schoenberg, Tom; Voreacos, David (21 February 2014). "Credit Suisse to Pay $197 Million in SEC U.S. Client Case". Bloomberg. Retrieved 27 March 2014. ↑ Han Shih, Toh (20 April 2013). "German prosecutors probe Credit Suisse tax evasion". South China Morning Post. Retrieved 7 September 2013. ↑ Crawford, David (8 November 2012). "Germany Probes UBS Staff on Tax-Evasion Allegations". Wall Street Journal. Retrieved 18 January 2014. ↑ "Credit Suisse AG says not subject to Swiss competition foreign exchange probe". Economic Times. 31 March 2014. Retrieved 8 August 2014. ↑ "Credit Suisse Pleads Guilty in Felony Case". Dealbook – New York Times. Retrieved 20 May 2014. ↑ Bart, Katherina; Freifeld, Karen; Viswana, Aruna (22 May 2014). "Credit Suisse guilty plea has little immediate impact as shares rise". Business Standard. ↑ Milmo, Dan (10 March 2015). "Prudential's Tidjane Thiam to take top role at Credit Suisse". The Guardian. Retrieved 10 March 2015. ↑ Ganesan, Gayathree. "Credit Suisse names new CEO of global markets". Business Insider. ↑ Langley, Alison (3 October 2002). "Credit Suisse To Prop Up Insurer Unit". The New York Times. ↑ Maude, David (2006). Global Private Banking and Wealth Management: The New Realities. John Wiley & Sons. ISBN 978-0-470-03053-0. ↑ McDonald, Oonagh; Keasey, Kevin (2003). The Future of Retail Banking in Europe: A View from the Top. John Wiley & Sons. p. 176. ISBN 978-0-470-85574-4. ↑ Crouhy, Michel; Galai, Dan; Mark, Robert (January 2000). "A comparative analysis of current credit risk models". Journal of Banking & Finance. 24 (1–2): 59–117. doi:10.1016/S0378-4266(99)00053-9. ↑ Jones, Sam (29 April 2012). "Credit Suisse fund plans London float". Financial Times. ↑ Plunkett, Jack W. (2005). Plunkett's Banking, Mortgages and Credit Industry Almanac 2006. Plunkett Research. p. 222. ISBN 978-1-59392-381-5. ↑ Fischer, Layna, ed. (2003). Excellence in Practice: Innovation and Excellence in Workflow and Business Process Management. 5. Future Strategies. p. 171. ISBN 978-0-9703509-5-4. ↑ Jones, Sam (11 January 2012). "Credit Suisse offers trades for eurozone shorting". Financial Times. ↑ Jones, Sam (17 November 2012). "Investors grapple with sector's multiple choices". Financial Times. ↑ Strasburg, Jenny (15 September 2010). "Credit Suisse Adds Heft in Hedge Fund as Rivals Exit". The Wall Street Journal. Retrieved 29 November 2012. ↑ Darbyshire, Paul; Hampton, David (2012). Hedge Fund Modeling and Analysis Using Excel and VBA. John Wiley & Sons. p. 250. ISBN 978-1-119-94563-5. ↑ "Credit Suisse's Top Holdings: A Brief Analysis". Seeking Alpha. 29 March 2011. Retrieved 21 October 2012. 1 2 Marshall, Julian (1999). "Best European Equity Manager: Credit Suisse Asset Management". Global Investor. 119: 15. ↑ Ceron, Gaston (9 April 2002). "Credit Suisse Fund Manager Tries to Do More With Less". The Wall Street Journal. p. C27. ↑ "Investment Strategy". Credit Suisse. Retrieved 21 November 2012. ↑ Eavis, Peter (1 November 2012). "The List That Big Banks Don't Wish to Be On". The New York Times / DealBook. Retrieved 21 November 2012. ↑ "Update of group of global systemically important banks (G-SIBs)" (PDF). Financial Stability Board. 1 November 2012. Retrieved 19 November 2012. ↑ "World's Most Admired Companies: Credit Suisse". Fortune via CNN Money. 2011. Retrieved 21 November 2012. ↑ "Credit Suisse retains crown as top global private bank in benchmark Euromoney survey". Euromoney. 7 February 2012. Retrieved 29 November 2012. 1 2 3 4 5 Loosvelt, Derek (2006). Vault Guide to the Top Financial Services Employers. Vault. p. 134. ISBN 978-1-58131-416-8. ↑ 25 Top Financial Services Firms. WetFeet. 2008. p. 35. ISBN 978-1-58207-801-4.